The Publisher Says: Sookie Stackhouse finds it easy to turn down the request of former barmaid Arlene when she wants her job back at Merlotte’s. After all, Arlene tried to have Sookie killed. But her relationship with Eric Northman is not so clearcut. He and his vampires are keeping their distance…and a cold silence. And when Sookie learns the reason why, she is devastated. My Review: Parting is such sweet sorrow. Sookie is not to have another annual entry in the Sookieverse after this. I got my first Sookieverse bite in 2001. I was dating Andy, who worked at the Half Price Books near my house. I stopped in after work one fine afternoon to make goo-goo eyes at him, and his boss complained. Andy handed me Dead Until Dark and told me to go wait in the bar down the strip mall. I barely noticed when he came in. I was hooked. Andy had some troubles, vanished, reappeared twice, then vanished for good. Sookie, on the other hand, has been with me, amusing me, sometimes making me mad, for twelve years. So thanks, Andy, for the longest relationship of my entire life! Even though it wasn't with you. And now Miss Charlaine has snapped that branch. She's whacked me in the readerly kneecaps. She's stuck the shiv into my pageturnin' shoulder. And, after I get my copy of After Dead this coming October, the what's-next wrapup of everyone in the Sookieverse's life or undeath, it will be all True Blood all the time. That's not a bad thing, I hasten to add, since there exists the possibility in each episode that either Alexander Skarsgard or Ryan Kwanten will get naked, but the series is real, real, real different from the books. And I loved the books first. And I will miss the books. I'm past the point in life where re-reading stuff seems like a good use of my eyeblinks. I'm well and truly past middle age...not a lot of 106-year-old men around...and there are squillions of books I want to read. Lucky me, in a weird way, that I can't work anymore as that leaves time to read. Not much money, but time! None of which I want to use re-reading even the most wonderful books. The events of this book are fast-paced. The people from Sookie's past are effectively deployed to move the plot along while also tying up the loose ends. The entire ending made me smile through tears. The last line? Well, sentimental old fustilugs that I am, that last line was a dam-breaker. Yeah. 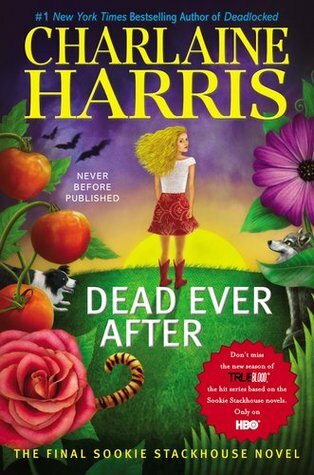 I am FOR SURE gonna miss these books, all Sookie's Jesusiness aside, all the moments I've thought Harris had lost interest or lost the thread or just lost me, all the emotional rollercoaster-ride queasiness...all of it is over now. Unlike every other relationship of my life, this one ends well. I'm smiling because it happened, if also sniveling a bit because it's over. It's been a terrific ride. All good things do end...but don't rush.